This is the first part of a two part article written by UCLA Men’s Assistant Coach, Ed Schilling. Ed guided Park Tudor (Indiana) High School to the 2011 and 2012 Indiana 2A State Championships prior to being hired by Coach Steve Alford at UCLA. He has been the Head Coach at Division I Wright State, has served as an assistant coach for John Calipari at UMass, with the New Jersey Nets, and at Memphis. Ed also served as a Head Coach for the Adidas Nations Program. He previously operated Champions Academy in Indianapolis–a skills training academy for players of all ages and skill levels. The highest profile players who work out with Coach Schilling are NBA and pre NBA draft prospects. At least one first round draft choice in each of the past 6 NBA drafts has worked out at Champions prior to the draft. As a player, Ed was a four year starter at Miami (Ohio). He holds the Miami single game, single season, and career assist records. In addition, Ed’s 18 assists in one game still stands as the Mid American Conference record. One of my favorite things about basketball–playing and coaching– is the friendship and comradery that develop and strengthen throughout the course of a season. Memories from the really good teams that I have been a part of are not my points per game, assists or minutes played. Those most meaningful memories are the brotherhood, the friendships, the good times in the locker room, and the joy of “going to war” together. Ask a professional athlete after he retires what he misses most, and he will probably tell you that he misses the relationships and putting on that uniform with his teammates and going to battle with those whom he has poured out blood, sweat and tears. As great and fun as athletics can be, the joy can be stolen and the unique opportunity to form life-long friendships can be easily missed when the vision shifts from the “we” to the “me”. The goal in sharing insights from over three decades of my playing, coaching and parenting is to help max out the enjoyment, the recognition, the improvement and the winning and avoid the “thief” of these of basketball delights. “Happiness ends where selfishness begins” –John Wooden. When playing high school basketball in Lebanon, IN, we had a team that had a blast together. We loved playing ball with each other, whether in the park in the summer or in the gym during the season. We trusted in each other and believed that we had each other’s best in mind. As a result of our trust, we were one of the best teams in the state. Although I later became a starter on Division 1 conference championship and NCAA tourney teams, I probably never had more fun and enjoyment than I did with that high school team. Perhaps the foundation of the positive experience laid in the fact that neither the players nor the parents had selfish agendas. We wanted to win and we cared about each other. I learned a significant lesson from that team—if one wants to really enjoy the basketball experience then value the other guys on the team. By the way, those parents had a great experience too. They didn’t worry about the coaching, stats, newspaper articles, rankings or awards—they positively supported and encouraged instead of complaining and manipulating for their child’s “benefit”. I have come to the conclusion after many years in basketball, that an athlete cannot truly enjoy the basketball experience if the parents are negative at home. Players listen and absorb what the parent’s say and carry the emotion of home into the practice and games. If the parents are “killing” the other players or the coach, the player cannot help but to be impacted. The negative impact steals the joy from the game, ultimately hurting the team. When the atmosphere is positive and encouraging those attitudes are reflected in the energy, enthusiasm and effectiveness of the players. A misconception is that individual stats get players opportunities to play at the next level. The truth of the matter is that every team has a high scorer. Scoring a lot doesn’t make or break a player’s future opportunities. If a player can “play”, college coaches recognize it and NBA decision makers see it. Playing well and helping the team win ultimately produces more recognition than getting big statistical numbers. In 1996, I was an assistant men’s basketball coach at The University of Massachusetts. We were #1 in the country for 10 straight weeks. Our star player, Marcus Camby, didn’t care about stats—he cared about winning. Some games he scored a lot, other games he didn’t. He didn’t finish with gaudy numbers, yet he was the National Player of the Year. He made his teammates and team better and the country recognized it. During the course of the ’95-‘96 season, nearly every player on the team had a major article or news story done on them. Even the players who rarely got in the games got noticed for their work in preparing the starters to execute well in the games. There were many players in college basketball that scored more and averaged more minutes, yet it was Marcus Camby who received the John Wooden Player of the Year award. There are examples after examples of players getting attention and promotion because of team success. On the other hand, if the team doesn’t win, chances are that college recruiters or NBA front office people will be skeptical of a player’s ability. Of course, one cannot promise that when players (and parents) channel their energies into making the TEAM the best it can be, regardless of the player’s role, that everything will work out perfectly. However, one can just about guarantee that if players (and parents) focus on personal stats and selfish agendas, promotion and recognition will be thwarted. 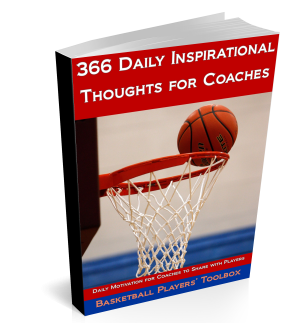 After decades in the basketball business, I cannot recall a single example of when a player got upset and “concerned” over numbers or minutes played where proved to be helpful to the player or to the team. The rules of the game of basketball allow only five players on the court for each team at a time; therefore, a majority of the team will be on the bench during the game. The players who don’t get to play in the game or don’t get a lot of minutes in the games are still almost always required to be at every practice and are expected to give their best effort at the practices. This is a challenging part of basketball. The attitude and effort given by that “bench player” in practice will significantly impact the team’s success. Further, the attitude and effort will significantly impact the “bench player’s” potential to do well if, and when, he gets an opportunity in the game. I spoke previously of the ’96 Marcus Camby led UMass team. That team got to the coveted Final Four in the NCAA Tournament. UMass played a talent-loaded University of Kentucky team in the Final Four. In the game, UK got off to a great start and UMass couldn’t get going and struggled most of the game. Midway through the second half Coach Calipari looked down the bench and called Giddell Padilla to go into the game. Now Giddell’s younger brother (Edgar Padilla) was the starting point guard, but Giddell who was a senior rarely played. In fact, as he was checking into the game the announcer said, “ Giddell Padilla to enter the game, let’s check his stats… Giddell Padilla has no real stats!” What people outside the program didn’t know was that Giddell challenged and competed every single day of practice and tried to beat the starting guards every minute of every practice—yet rarely did he get any time in the games. In practice, he often out played the starters. When Giddell got into that game he made an immediate and positive impact. He stole the ball and took it in for a lay-up, then deflected a pass, then an assist. All of a sudden UMass got some momentum and the crowd of over 20,000 started roaring, UMass was back in the game. Giddell Padilla played well and actually played more in the second half of the Final Four game than he did the entire season. How could he play so well on such a big stage? The reason he played so well was because he competed well against the starting backcourt (which was one of the best in Division 1 that season) every day in practice. He could have been upset that his younger brother was a starter or that he deserved to play at least some minutes, but he wasn’t. He found enjoyment in the team’s success, and he “stayed ready” to play in the game by working everyday in practice. Well, UMass lost that close and highly competitive game to UK who became the National Champions two days later, but Giddell Padilla’s performance did not go unnoticed. Shortly after the season, he was offered and accepted a lucrative contract to play professionally in his native country of Puerto Rico where the game had been televised. He became somewhat of a celebrity in Puerto Rico because of one game—one game that happened because he “stayed ready” even-though his chance of actually getting in the game was doubtful at best. By working to make those guards playing ahead of Giddell better, Giddell got better himself. His unselfishness and consistent effort put him in a position to have an experience that positively impacted the rest of his life. Unfortunately, I have seen the opposite happen so often when “bench players” lose their drive to practice with passion, then when their opportunity does come in the game, they perform poorly. Further, staying focused and passionate on the bench during games is important. If Giddell had been stretched out on the bench, not paying attention or had a sour look on his face because he wasn’t getting any playing time, it is unlikely that Coach Calipari would have put him in. Giddell’s effort in practice for six months could have been thwarted by six seconds of bad non-verbal on the bench when Coach Cal looked his way.